A new composting system will be unveiled to students starting from the first week of the spring 2019 semester. Efforts to provide Trinity with a reliable method of composting has been a long-standing initiative of both staff and faculty. Composting on campus began as a student-run effort with assistance from the Office of Community Service, according to Sustainability Coordinator Rose Rodriguez. In the beginning of the 2018-19 school year, compost bins were located in Mather for students to use. These bins were manually transported by student volunteers to a compost plant. In October, Blue Earth Compost, a local garbage collecting company was contracted to manage composting in Mather and the Bistro. Blue Earth retrieves bins from campus, taking the responsibility off of student volunteers to transport the bins themselves. As explained by Rodriguez, composting during the fall of 2018 was done entirely “behind the scenes” in the kitchens of Mather and the Bistro. However, the first week of the spring semester will see the addition of composting bins at the front of the house, which leaves the responsibility of composting correctly, in part, on the student body. To help alleviate the questions of what is compostable at Mather, volunteers will be available at every meal to direct students on how to get rid of what is on their plate. 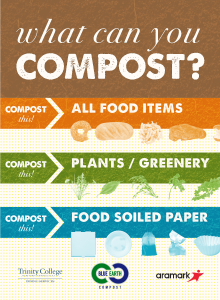 Students will be given material to learn more about composting, and informational posters will also be placed in Mather. These students will be volunteering for the first week to ensure that students understand how to compost. As Rodriguez explained to the Tripod, much of what is found in Mather is compostable- including paper napkins and cups used for smoothies (not including straws). Students in Mather are encouraged to look for glassware labeled as Greenware, which are created from a biopolymer derived from plants and are able to be composted alongside other products. However, the silverware provided by Chartwells is not compostable, and may present a challenge to the process as the semester goes on. If a product such as a fork, spoon, or knife is accidentally thrown into a compost bin, the bin becomes contaminated. While the products in the bin are still able to be composted, it is a burden for the company to sort through contaminated waste. For the first three months, Blue Earth will provide feedback and warnings regarding the number of bins that have been contaminated. After three months, a fee of $2.50 (50% of the initial fee to compost) will be imposed for each contaminated bin. “This is a partnership between Trinity, Chartwells, and Aramark (Trinity’s facility company)” commented Rodriguez. “Everyone will need to work together for composting to be a success.” She predicts that a contaminated bin, or a misplaced fork, will most likely be inevitable, but can be avoided as much as possible with proper education regarding compost. Students have played a crucial role in the implementation of composting bins in Mather. According to Co-President of Green Campus Nat Bush ’19, the newest phase of composting at Trinity has been a group effort of student volunteers led by Green Campus, ConnPIRG, and the Sustainability Committee of the Student Government Association. As explained by Bush, composting in the Mather kitchen with scraps from cooking has been accomplished smoothly, without contamination in the bins. Students that have been working on this project hope to see similar results in the front of Mather. 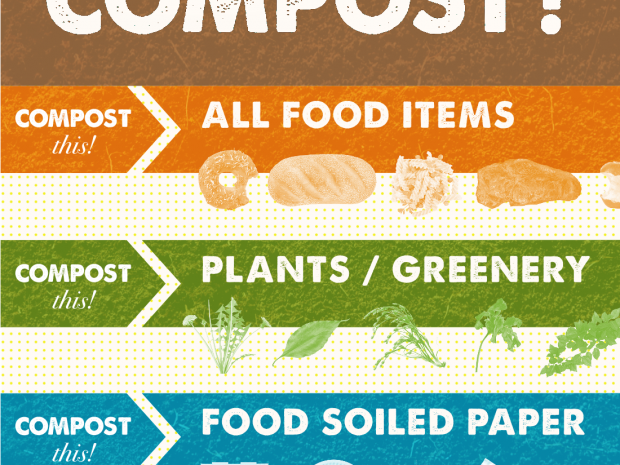 “There has been a lot of progress regarding composting. It’s great that it is no longer a responsibility of students to transport compost bins off-campus,” they explained. There are currently compost bins located in the kitchens of the Bistro. According to Rodriguez, a year of data will be compiled at Mather before making compost bins accessible to students in the Bistro and the Cave. In comparison to Mather, these two dining halls offer more challenges for composting, as both offer many more to-go food and packagings. 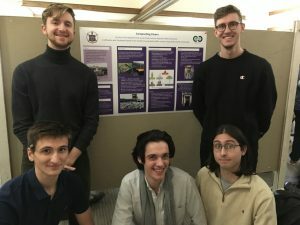 Max Fertik ’19, Oscar Dial ’19, Jackson Ruprecht ’19, Rafal Szacilowski ’19, and Jake Fredo ’19 plan to implement composting in the Crescent Townhouses. Additionally, an initiative to bring composting to the Crescent Street Townhouses has been spearheaded by Max Fertik ’19, Oscar Dial ’19, Jackson Ruprecht ’19, Rafal Szacilowski ’19, and Jake Fredo ’19. The students were inspired by the course “Global Perspectives in Biodiversity and Conservation” taught by Professor Pitt. 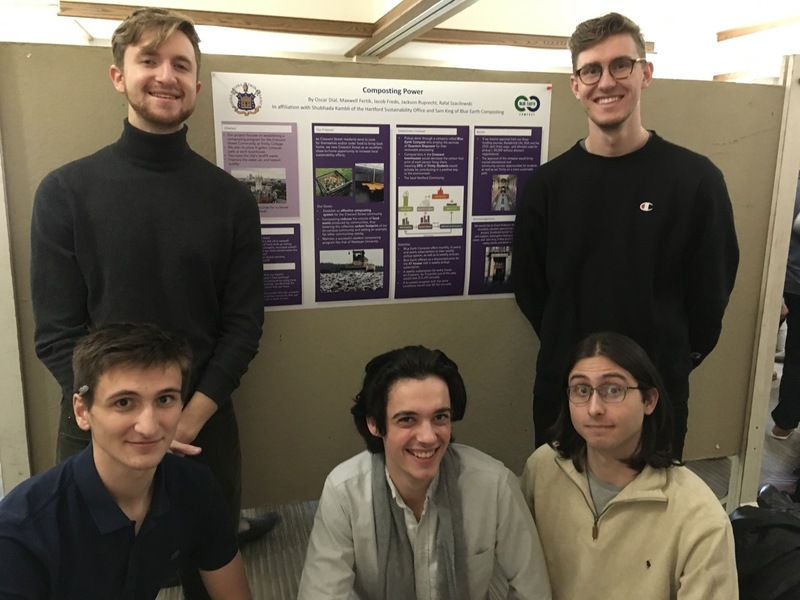 According to Fertik, the students focused on broadening the composting initiative in Hartford as their final project for the course and did extensive research regarding the topic. They consulted Sustainability Coordinator of the City of Hartford Shubhada Kambli to create a municipal compost program in the city. The students also reached out to Blue Earth Compost representative Sam King at their headquarters in East Hartford. For their project, the students narrowed their scope to composting at Trinity and felt that the Crescent Street Townhouses would be an ideal place to start as they are equipped with kitchens. Additionally, Fertik explained that composting from the Crescent Townhouses could inspire positive sustainable habits for students moving to their first apartments. 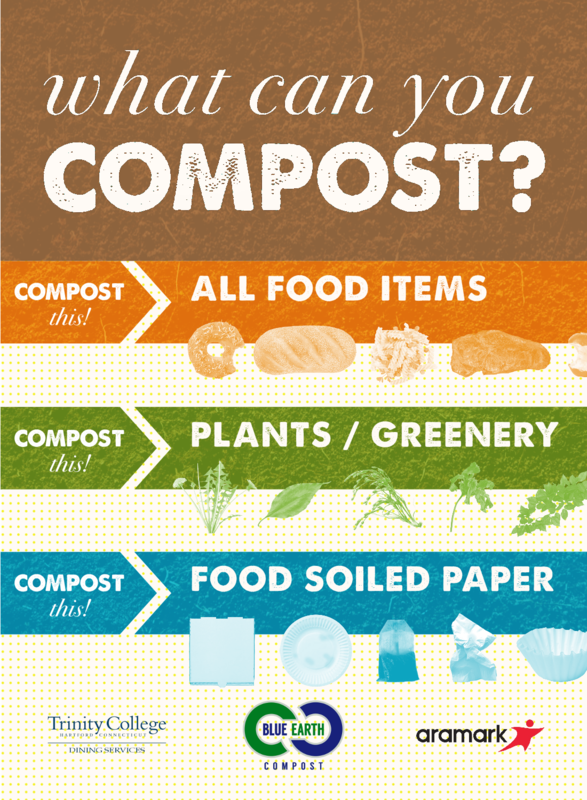 The “pilot year” of Crescent Street Townhouse composting is planned for the 2019-2020 school year and hopes to be funded by the Office of the Trinity CFO, SGA, and the Office of Residential Life.